Located in the city of Fürth, Bavaria, Germany, the Arts & Scents Perfumery immediately pulled at The Makeup Examiner’s heartstrings -- as TME’s ancestors hail from Bavaria. But, commonality of location and whimsy over one of my ancestral homelands is certainty not enough to win me over. However, a young brand that masterfully creates a symbiosis between artistic elements and fragrance will always get my heart pumping. Arts & Scents perfumers offer numerous collections, containing perfumes reflective of each collection, and today we’re going to take a look at The Scent of Elements Collection. Skillfully curated, The Scent of Elements Collection contains six unique perfumes that reflect the natural elements surrounding us. Beyond what one will find inside each scent is an artistically crafted label that intrigues and engages the senses even further. The Scent of Elements Collection, by perfumer ManuelaPfannes-Völkel, consists of the following six Eau de Parfums ($95 - 60 ml bottle) -- Fantastic Green Bird, Cuero de Mexico, A Day in Grasse, Light of Ormuz, Dream of India, and Green Sea Coral. Fantastic Green Bird (launched 2014) is a fantasy-like perfume that aims to tempt those around the wearer. Masterfully marrying fragrances of opposing seasonal scents, Fantastic Green Bird is an all-seasons perfume. Cuero de Mexico (launched 2010) is as intoxicating as a hot night in Mexico evoking thoughts of adventure and romance. This unique fragrance combination offers sweet purple jacaranda blossoms that merge effortlessly with myrrh and leather. Cuero de Mexico would be lovely for many occasions and is also an all-seasons perfume. A Day in Grasse (launched in 2010) with a blend of citrus, rose and red clover this classic Chypre perfume is definitely the perfect warmer weather fragrance. A Day in Grasse is a romantic and whimsical perfume. Light of Ormuz (launched in 2013) is a very fresh, clean scent and my favorite. Mint is the immediate evident scent, which brings about the feeling of reenergization and gives way to a light cedar fragrance. Light of Ormuz is the perfect scent to clear your mind and keep focused. Although Light of Ormuz leans toward a warmer weather fragrance, I could easily wear this scent year-round. 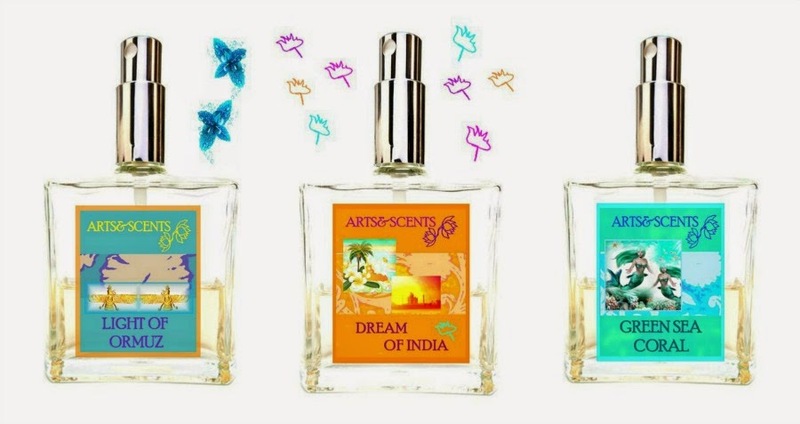 Dream of India (launched in 2013) encompasses the exotic scents that one would image of India. Spices, exotic flair, scented flowers, colors, spiritual enchantment, joy of living and sensuality are all presented in this perfume. Dream of India is the perfume to reach for when seduction and adventure are on your mind. Dream of India is a good scent for the warmer months, but is very fragrant so a light touch is all that’s needed. Green Sea Coral (launched in 2009) is an energizing cocktail for the senses. Aptly named, Green Sea Coral truly embodies the aroma of days (and nights) spent beachside. The unique fragrance note of sea grass and water flowers comes together with energetic grapefruit drops to create an invigorating olfactory experience. Hands-down, Green Sea Coral is the perfect summer fragrance and a must-have for the winter months when one needs a pickup from the frigid elements. It is highly unusual for The Makeup Examiner to enjoy such a wide variety of perfumes. I tried to find something to dislike, but each perfume is so masterfully blended that there isn’t one in the collection that I wouldn’t wear. As I mentioned in opening, Arts & Scents perfumes go beyond what’s inside each bottle with packing that is handmade from a Russian artist. The brands name truly states what this perfumer embodies … the beautiful marriage between perfumery and art and the effect that these elements have in our lives. Arts & Scents perfumes can be found online at Arts & Scents.